Illustration by Georges Topfer titled Le châtiment de l'adultère ("The punishment for adultery"). 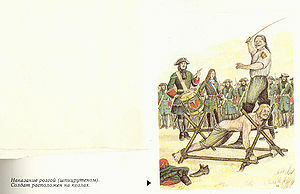 Russian military flogging using a special frame. A whipping frame is an item of spanking furniture that serves to position a spankee for a spanking (usually with an implement). They are commonly used in judicial and prison corporal punishment. The spankee is often restrained when such frames are used. These frames come in various designs and sizes, and may be known by different names - trestle, A-frame, triangle, rack, etc. They are typically made up of connecting bars of different lengths and thicknesses, constructed from material such as wood, metal or bamboo. Frames can be designed to serve as birching horses, birching stools or spanking benches. The part of the frame where the spankee rests on can be padded for more comfort and better support. Flogging triangles were used in Britain and some British overseas territories in the 19th and 20th centuries for floggings with the cat o' nine tails on the spankee's upper back. Some of these frames were for dual purposes - floggings on the back as well as punishments on the buttocks. The spankee can bend over a padded crossbar on the frame and have his wrists secured to the base of the frame's third leg at the rear. British soldier, tied to the Triangle, being flogged with Cat-O-Nine-Tails. A-frames are used for judicial caning in Malaysia. The frame, possibly based on the British flogging triangle design, consists of two strong wooden bars, 2-3 meters long, erected in an "A" shape at a slight angle that hold the spankee in a leaning-standing position. A crossbar with a cushion or padding mounted on it provides support for the spankee's pelvis and causes his buttocks to stick out slightly. The "A" construction is supported by a third bar, like an artist's easel. The spankee is restrained in an inward-facing spreadeagle-like position, with his hands tied to the top of the frame above his head and his feet spread apart and tied to the two legs of the frame. An A-frame on display at Pudu Prison, Malaysia. Caning trestles are used for judicial caning in Singapore and Brunei and their design is different from that of the Malaysian A-frame. The spankee bends over a padded crossbar on the caning trestle and is restrained in a bent-over position with his feet together.